I'll bet you think that the block is the 'X' don't you! Nope... the block has a part of the 'X' in each corner and a pinwheel in the center. Aahh... now you see it! It's fun! 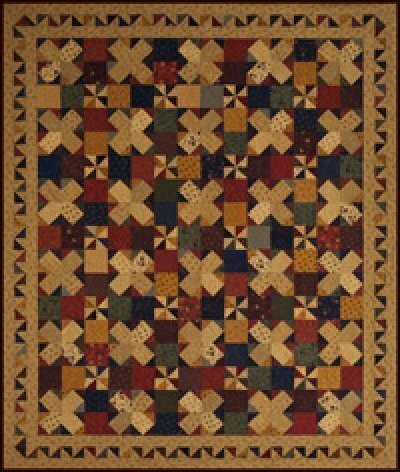 The blocks go together easily and the design is completed with a row of units along the outside edge of the quilt center. I added the Half Square Triangle border for a touch of whimsy. Maizie Emm is fat quarter friendly and I used fat quarters from the Bound To The Prairie & Bound To The Prairie 2 collection by Kansas Troubles Quilters from Moda fabrics. Quilt measures approximately 68" x 80".